Research on European food culture has expanded substantially in recent years, telling us more about food preparation, ingredients, feasting and fasting rituals, and the social and cultural connotations of food. At the First Table demonstrates the ways in which early modern Spaniards used food as a mechanism for the performance of social identity. People perceived themselves and others as belonging to clearly defined categories of gender, status, age, occupation, and religion, and each of these categories carried certain assumptions about proper behavior and appropriate relationships with others. Food choices and dining customs were effective and visible ways of displaying these behaviors in the choreography of everyday life. In contexts from funerals to festivals to their treatment of the poor, Spaniards used food to display their wealth, social connections, religious affiliation, regional heritage, and membership in various groups and institutions and to reinforce perceptions of difference. Research on European food culture has been based largely on studies of England, France, and Italy, but more locally on Spain. 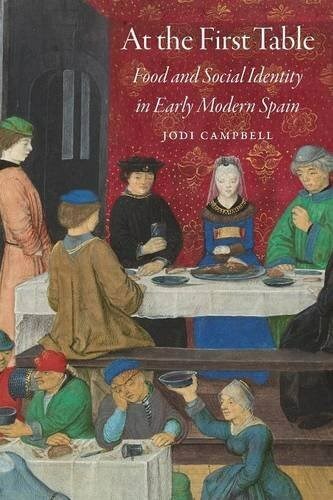 Jodi Campbell combines these studies with original research in household accounts, university and monastic records, and municipal regulations to provide a broad overview of Spanish food customs and to demonstrate their connections to identity and social change in the sixteenth and seventeenth centuries.